I survived the 100-Mile Wilderness, and it was not as tough as I’d feared. But that doesn’t mean there weren’t times — and there were many times — that I wanted to quit. The bugs weren’t apocalyptic like seemingly every blog had warned, and it didn’t rain every day — just seven out of nine. But it was a tough, long slog for a beginner, filled with rain, dirt and doubt. The Appalachian Trail is called the Green Tunnel because you walk for hours in the woods without seeing the sun. In that vein, I dubbed Maine’s 100-Mile Wilderness the Root Canal. Every step you take, it seems, you must dodge slippery spaghetti-shaped tree roots, slick rocks and bogs of mud with the texture of Nutella. Take a wrong step, and you are on your backside or stuck in the muck up to your knee. One day early on, my left leg was swallowed by the mud, only to be rinsed clean when I skidded down a barkless tree bridge into a stream within the hour. Nature sullies, and nature washes away. I slipped and fell more than two dozen times in the Wilderness. I always hurt somewhere; the aching in my feet was more painful than the worst dental procedure I’ve experienced, and that pain was constant. The biggest challenge, though, was the loneliness. Sometimes you could hike all day and talk for no more than 30 minutes of that 12 hours in little five-, 10- or 15-minute chats with passing hikers. The nights setting up a tent in the dark, soaked to the bone, with no one with whom to commiserate about your pruned and swollen feet or your struggles on White Cap, could turn your epic adventure into a forced march. Those were the days I longed to quit the trail and head home. Back home in the suburbs, there is certainly magic every day. Spending the morning at school hanging out with Marlowe and one of her best friends during the second-grade readers theater is magic. Watching Forrest and his soccer team play two guys short — seven players versus nine — for an entire month and fall just one quarter short of winning the league championship, that’s magic. Putting off bedtime for an hour because you can’t put down “Harry Potter” after hours spent together, lost in an amazing tale, is undeniably magic. There is magic every day back home, but unfortunately you are too plugged in or wound too tightly to notice it. Every day I found magic that kept me going. I met four young hikers in the Wilderness who asked if I was enjoying the blueberries. “I’ve read ‘Into the Wild,’ ” I confessed, “and am too afraid to try any wild food.” (Chris McCandless died in a school bus in Alaska after eating the wrong part of a potato plant. McCandless knew much more about the outdoors than I ever will, so I’m playing it safe.) 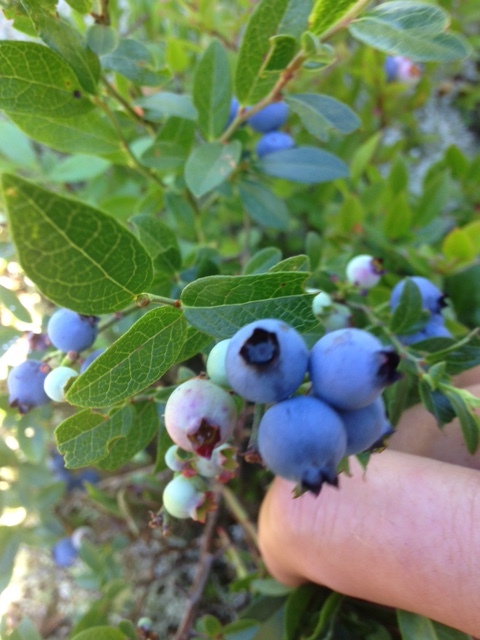 You can’t miss the blueberries, one hiker said as he knelt down and picked dozens. “If they have crowns, they’re blueberries,” he said, showing me before he shoveled them down. I’ve been eating blueberries ever since. Magic. The cry of the loon is magic. A day in town with real food and real beer and good conversation with instant friends is magic. Reaching a dry shelter minutes before a deluge, talking Jon Lester and the Cubs with a Red Sox fan, watching a beaver’s hunt for sticks, discussing the Old Oaken Bucket and college football with a Purdue grad, all of these are magic. After a bad day on trail spent mostly alone after getting myself lost atop Moxie Bald — don’t let your friends text and hike! — a northbound hiker pointed out a beautiful stealth camping site. It saved my day. The next morning, though, I was still feeling a bit blue as I struggled with my energy level while climbing another peak. So I stopped for a coffee and found a double-dose of magic. “Nacho Libre,” a hiker I’d heard of in advance because he has been on trail for eight months, gave me a doughnut. (A doughnut with my coffee in the middle of the woods?!? Life gets no better.) When he left, I chatted with his friends heading north: two Peace Corps buddies, “Nap Time” and “Smoke Signal.” We talked for an hour — Nap Time is the first Hoosier I’ve met and knew all about Sun King — and I left that shelter transformed. My energy was back, and my 6 miles to town were a snap. I was renewed. It was magic. The kindness of strangers is magic, but some people take that to a whole ‘nother level for hikers; that’s trail magic. That can be a Boy Scout troop leaving a barrel full of peanut butter jars in the middle of the Wilderness. Trail angels, as they are called, give hikers rides into town or pass out sodas on the trail. They let people stay in their homes. Angels might cook you breakfast. Mostly, trail angels lift your spirits and keep you going when too many rainy days have sapped your will to push on. People give trail magic for many reasons. Some angels are former hikers who are paying forward kindness shown to them. Some must get a rush from the smiles they leave in their wake. Only 2 1/2 weeks into the trail, I’m already amazed by the generosity I have seen. I’m also convinced I will find no better trail angels than two I’ve already met. “Scout” and “Birdman” I will never forget. Twenty miles into the Wilderness, I started meeting excited northbounders spreading word of some amazing trail magic ahead. These two gentlemen had let one guy spend the night in their cabin and made him breakfast. His hiking partners had filled up on Coca-Cola, beer and hot dogs. Everyone I passed gushed about these guys. For 65 miles, the thought of that food and drink drove me. Every tough day was doable because I knew hot food and cold beer were just 50, then 40, then 28 miles away. … Each night, I would meet up with “Firegod” and “Sticks” and we would fantasize about this food. I had dreamed of this for 65 miles, yet somehow it exceeded all expectations. I walked in, and Dan (“Birdman,” formerly “Lobster Boy,” my favorite trail name ever) said, “How about some cheeseburgers?” He was wearing a Minnesota Wild sweatshirt, so I figured I better tell him I was a Blackhawks man before I entered. Apparently — thankfully! — there are no rivalries with trail magic. Dan was actually a Bruins fan — another Blackhawks playoff victim in recent years — and welcomed me with open arms. I asked about “Yogi Bear,” the reason Terry (“Scout”) and Dan, a lifelong friend, were out here. Yogi Bear was Terry’s son and an avid hiker. Last year, Terry, Dan and others spread Yogi Bear’s ashes during a memorial in the 100-Mile Wilderness. Terry and Dan had been out here for two weeks, honoring Yogi’s memory and making hikers’ days. My friends got barbecue chicken and hot dogs; I had two amazing cheeseburgers and three beers. Dan turned on the generator so I could charge my iPhone. They showed us a picture of one hiker whose feet they had soaked in Epsom salt. They told of how they had shuttled some hikers to town for resupply, 11 miles away but a 45-minute drive each way. They had extra supplies they offered us. They had a toasty fire where we could dry out. They quite simply restored my faith in humanity with their inspiring generosity. Why were they doing this? Hanging with Yogi’s people made him closer to them, I surmised. I more than most understood that. As I hike in memory of my father, Rob Bacon, I feel so close to him out here in the wild. Despite the cold and wet, my father’s spirit warms me. Terry and Dan must feel the exact same way. Theirs is a selfless act, but I’m sure they get more out of it than they give. I’m sure, too, that Yogi is looking out for them. 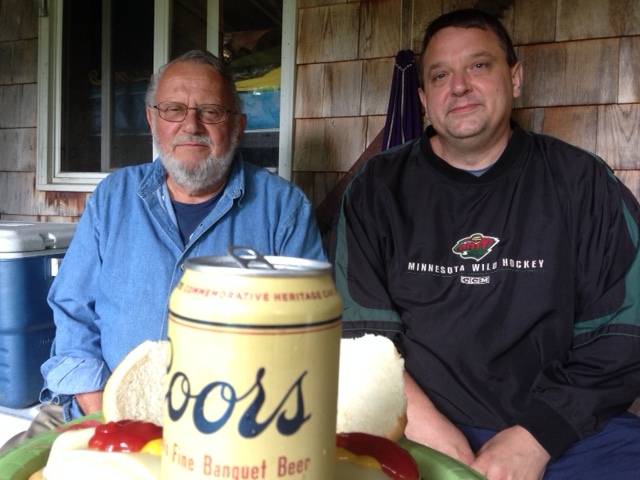 A few days before I arrived, Dan had left a case of Coors he was buying for hikers on his shopping cart back in town. So he turned around and drove 45 minutes back to the store. When he walked in, the cashier said, “I know why you’re here. … Your case of beer?” Someone had found a free case of beer in the parking lot and had taken it back inside and returned it. Who does that? How does that happen? I know, and Dan and Terry know, too. It was magic. And there’s one last bit of magic from my two hours with these incredible trail angels. I stopped at their cabin on the final day of their weekslong run. If I had spent 10 days in the wilderness as I’d first planned, I would’ve missed out. That crushing blow might’ve sent me crawling home to Indiana. But I had magic on my side. Terry and Dan ask only one thing of the hikers they meet: Send them a picture from the end of the 2,180-mile hike, Mount Katahdin for northbounders or Springer Mountain, Ga., for southbounders such as me. I’d like to ask one more thing for them. Next time you are giving a toast, raise your glass to Yogi Bear and Rob Bacon. They’re out there, somewhere, smiling. Beautifully written Steve. Your words brought me to tears remembering the loss of my Dad, although not really remembering… the loss is always right there below the surface. Safe travels to you. Kim, you know our fathers are with us and they always will be. It’s what keeps me going! Great to hear from you, and thanks so much for reading. Kinda sad I didn’t push on past the hundred with you! It was a blast getting to share in the trail magic with ya. Good hiking Huckleberry and if you see Firegod again give him my best as well! Sticks, without you and Firegod, I never would’ve made it through the Wilderness. It was a pleasure hanging out with you! I saw Firegod that next morning at Shaws and haven’t seen him since. I did run into Magoo and Gigi, who are back on the trail together. Magoo even left me a note in a shelter journal, encouraging me onward. … Any time you feel like hopping back on the trail, I’d love to hike with you. I’m in Stratton tonight and will be easy to find, slowly making my way south. Good day my wilderness friend. Glad to see you are still progressing along. 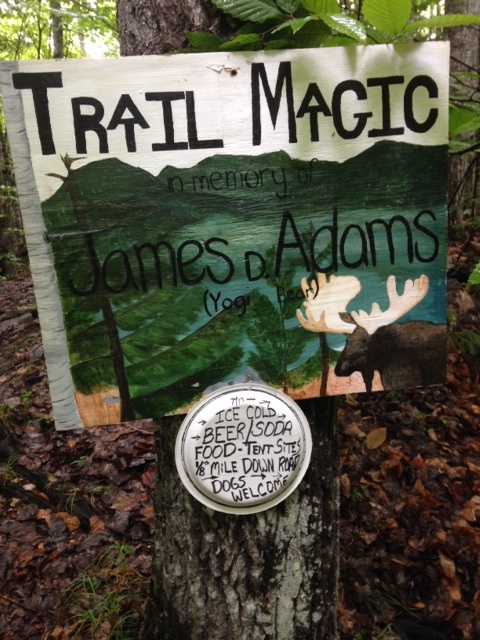 I was up at camp last weekend and was thinking about you and all the others who stopped by our trail magic. Scout & I figured we served about 450-500 hikers this past summer. Now I feel like hibernating with the bears to rest. Good luck on the rest if your journey. Wonderful too hear from you, Birdman! I think of you and Scout often. You fine fellows made sooooooo many hikers’ days. Someday I hope to be able to return the favor and buy each of you a drink of two. I’ll be sure to send Scout a photo from Springer when I get there. Slow goin at the moment, but I plan to pick up the pace. My wife and I were lucky enough to enjoy your company and trail magic this summer in the middle of our Flip Flop thru hike! We finished a month ago and are in the process of sending out summit pictures and thank yous to all the wonderful trail angels who helped us out on our journey. Unfortunately, though we wrote Scout’s address down the HUGE rain storm that ran us through the rest of Maine destroyed it! Any chance you could provide us some contact information? PS – Anyone else reading this who might have the e-mail / mailing address for Scout and Birdman and would like to pass it along, I’d really appreciate it!